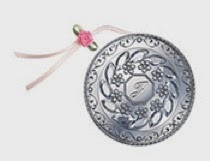 Jill Stuart will release a new Fluffy Silk Powder Foundation N (5000yen) and a limited edition shade of its Secret Control in 06 Radiant Effector (2800yen) on 5 September in Japan. The new foundation formula promises enhanced hydrating benefits, a lightweight semi-matte finish and better coverage. It will be available in 5 shades with SPF15 PA++. 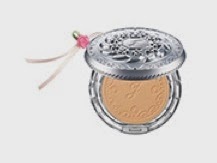 The foundation refill costs 3500yen while the limited edition compact case costs 1500yen. See another pic here and here. Some brands are cheaper to buy at the airport like Shu Uemura, Anna Sui, Jill Stuart, Three, RMK and Lunasol as the discount is around 25% compared to prices in town. The Shiseido brands like Maquillage and Cle de Peau are only discounted by the sales tax (8%). Kansai airport has a big dutyfree cosmetics section from what I recall of my trip in 2011 and you should be able to find the brands mentioned above there. Also if you like Jill Stuart, they usually have travel exclusive products and sets that are not available at the counters in town. If it is a product that is limited edition that you really want, I would advise buying it in town as there's no guarantee that it will be available in the airport. Some brands like Addiction are not available at the airport dutyfree. For snacks, you can't go wrong with all the different flavors of Kit Kat at the airport (especially the green tea one), as well as Tokyo Banana (a fluffy sponge cake). I love anything green tea (matcha) flavored, so I usually buy lots of matcha-flavored snacks like chocolates. For beauty products, I like brands like Addiction, Three, Lavshuca, Integrate, Suqqu that are not easily available outside of Japan. Addiction does excellent eyeshadows, blushes while Three's eyeliner pencils are awesome. Lavshuca's mini lipsticks and blushes are gorgeous while Integrate's gel eyeliners are good too. Suqqu's eyeshadow palettes are my everyday staple. If you are looking to invest in good brushes, you can't go wrong with Hakuhodo and Chikuhodo, or RMK brushes. Hope that helps! The range of brands available in Japan is just mind-boggling and it's easy to get overwhelmed but hope you have lots of fun shopping! OMG YOU ARE AWESOME. Thanks a lot for the recommendation. Have a wonderful day!